Since my first visit to Madrid, the Spanish capital has become one of my favourite European destinations: a city full of interesting museums, pretty plazas and parks, lively markets, and breathtaking architecture, not to mention the continent’s most exciting food and drinks scene. 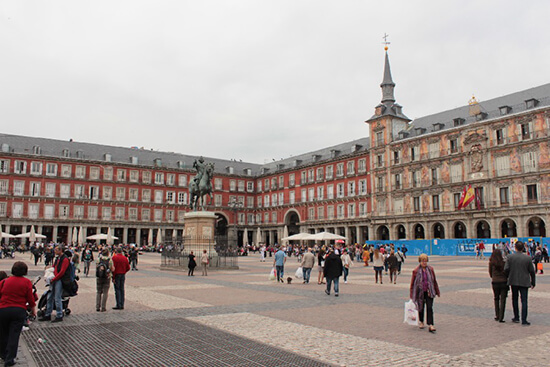 Madrid’s premier square has been a focal point of the city since its construction in the 17th century. The beautiful plaza has an unsavoury past, having hosted trials and public executions throughout the inquisition, but is now a vibrant centre of life with restaurants, bars and shops, weekly markets, and a number of cultural events happening throughout the year. A main viaduct in the city, the tree-lined Paseo del Prado and its surrounding streets are the city's beating heart, home to a number of museums, majestic government buildings, monuments, and luxury hotels. 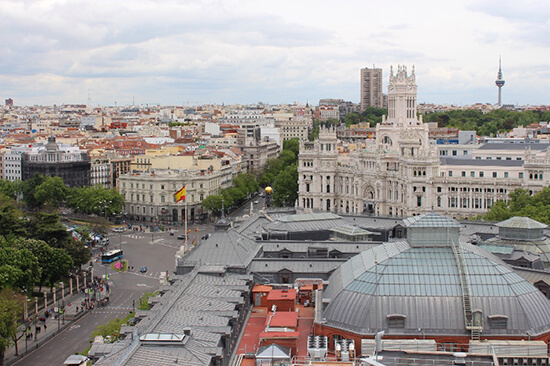 Admire the beautiful design of the Metropolis Building and the Palace of Communications across the fountain at Plaza de Cibeles, and visit the rooftop at the Circulo de Bellas Artes to enjoy stunning views over the city with a glass of wine in hand. Arguably the focal point of Madrid’s Old Town, Puerta del Sol (literally 'Gateway of the Sun') is a popular meeting place for locals and visitors alike. Multiple intercepting streets, many of them pedestrian only, stem out from the square at the centre, all of them overflowing with busy bars, hip cafés, and trendy fashion stores. While you walk around the lanes window-shopping, be sure to look up and admire the flawless architecture of the buildings in this area. The green jewel of Madrid is not only the perfect place for an afternoon stroll, but a popular attraction on its own. 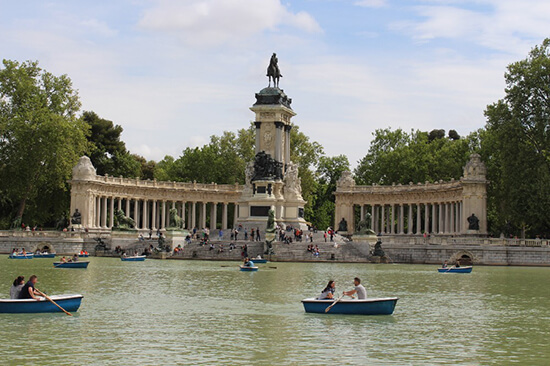 The historic El Retiro has many tree-lined pedestrian and cycling pathways, a pretty lagoon where visitors can rent out paddleboats, and a multitude of grand statues and monuments to admire. The park is also home to cultural events, with rotating art exhibitions at the Centro Cultural Casa de Vacas, free outdoor concerts throughout the year, and a large second-hand book market held every Sunday morning. Home to the royal family of Spain for centuries, the Palacio Real was built to impress and can easily be considered as the most remarkable royal residence in the world. Although state events are still sometimes held at the palace, the royal family has long moved out, and the palace has now become a museum. Admire flamboyantly-decorated rooms, full of extravagant antique furnishings and beautiful art, and learn about the history of the Spanish royal family through the ages. Often underrated for its museums, Madrid is actually home to a wealth of priceless masterpieces, distributed mainly between its two major art galleries, the Museo del Prado and the Museo Nacional Centro de Arte Reina Sofia. 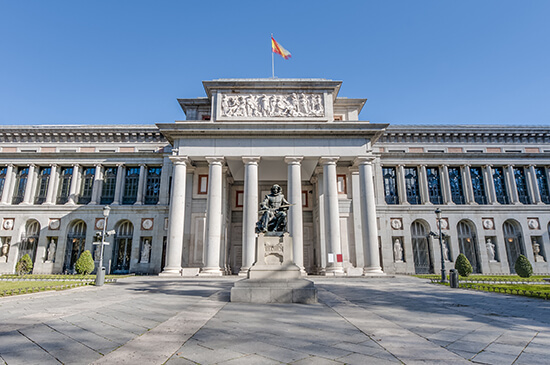 Museo del Prado is home to one of the best collections of European paintings as well as the largest collection of Spanish art in the world, while the Reina Sofia focuses on 20th century paintings and sculptures. It also has multiple pieces by two of Spain’s most renowned artists, Dali and Picasso, with Picasso’s famous Guernica at the centre stage. Indulging in Spanish food is one of my favourite reasons to visit Madrid, with great meals easily found at any restaurant, cafeteria, or market. 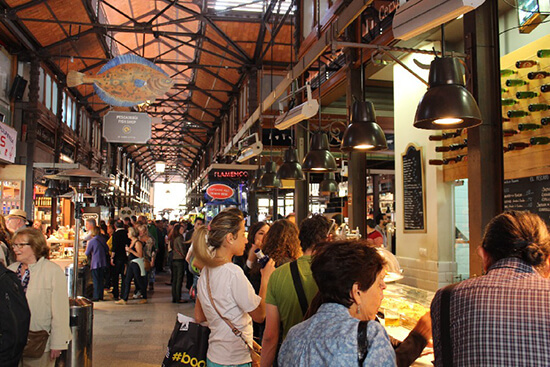 My favourite place to indulge in tapas and pintxos is the pretty Mercado de San Miguel, a historic 19th century indoor market just around the corner from Plaza Mayor. Here, you can walk around the different stands having a taste of all sorts of local delicacies, seafood and sweets, washed down with inexpensive glasses of lager or local wine. For popular Spanish favourites such as paella or salted cod in tomato sauce, your best bet is to visit a cantina, many of which will feed you for free, as long as you purchase beer or wine. 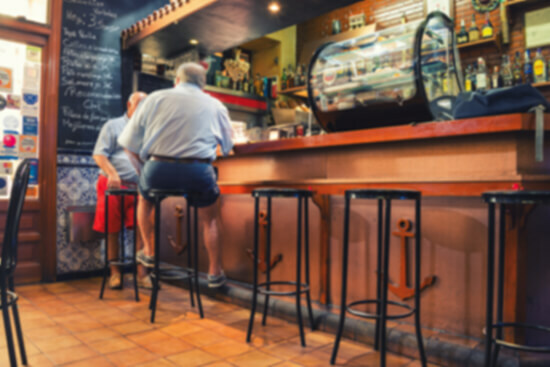 Madrid has a higher number of bars per capita than any other European city, so you won’t need to go far to find a place to grab a refreshment, no matter which district you find yourself in. In central Madrid, my favourite bar is the quaint La Venencia, a small family-run sherry cantina. Stand by the rustic bar and choose one of five sherry options, along with a variety of rotating salted meats, nuts and olives to go with it. The cellar-like atmosphere is perfect for a pre-dinner aperitif, but make sure to respect their no photography rule, as they take it very seriously! 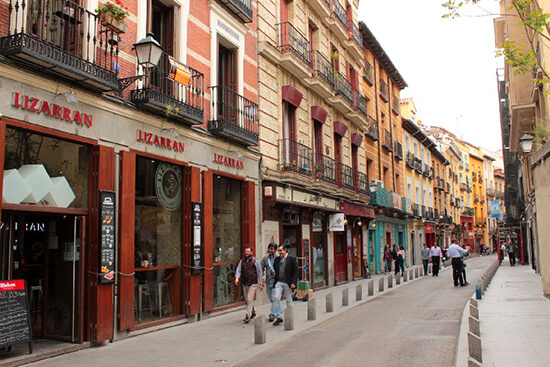 Madrid is surprisingly compact, which means you can easily get around on foot if you wish. If you prefer, the Metro system is very efficient, although it can sometimes be confusing figuring out which trains go where, as different trains will only go so far on certain lines. Unless you are fluent in Spanish, you should avoid travelling by local bus, as their routes seem impossible to decipher at the best of times. Madrid is best experienced in the spring and autumn. At these times, the temperature is warm but not stuffy, the streets are full of life, cultural events pop all over the city, and the parks come alive with colourful flowers in spring and hues of orange and yellows in autumn. Note that spring can be especially rainy, so go prepared with a light rain jacket! Due to Madrid’s altitude, winters can be surprisingly cold, limiting outdoor activities and the general mood of the city. Conversely, summer is unbearably hot, leading locals to abandon the city for the coast en masse and, in turn closing many restaurants, bars, and smaller museums for the season. 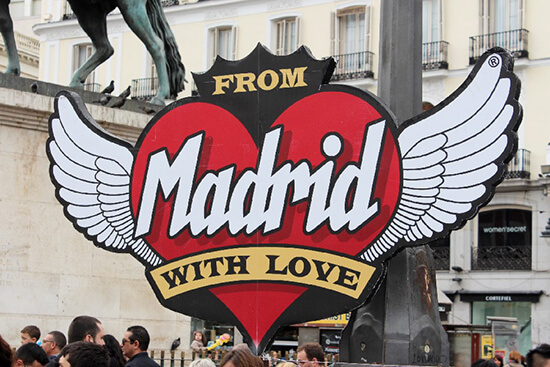 Enjoy the best of the city with one of our Madrid Holidays. Travel addict with a mild obsession with international cuisine and craft beers. Although I am happiest exploring the streets of a vibrant city, I enjoy discovering quiet villages, hiking mountains, kayaking seas, and the odd day or two lazing on a beautiful beach.